The surprising effects of the Solar Eclipse of July 2010 on geopolitical events and on the financial markets are thoroughly illustrated and discussed in this fascinating e-book by Tim Bost. 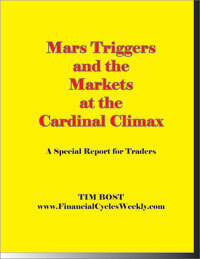 Market astrologer Tim Bost shares some of the key insights he has gained through decades of research and real-world trading experience. Here are the powerful components of a successful trading plan, to help you integrate and activate the entire Trading Triad.